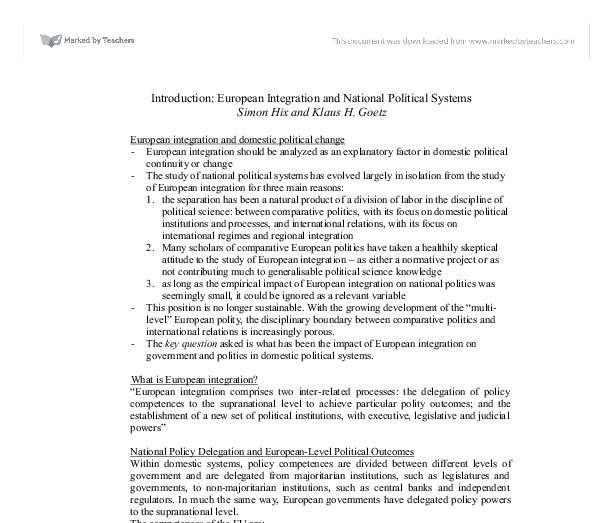 European Integration and National Political Systems. Introduction: European Integration and National Political Systems Simon Hix and Klaus H. Goetz European integration and domestic political change - European integration should be analyzed as an explanatory factor in domestic political continuity or change - The study of national political systems has evolved largely in isolation from the study of European integration for three main reasons: 1. the separation has been a natural product of a division of labor in the discipline of political science: between comparative politics, with its focus on domestic political institutions and processes, and international relations, with its focus on international regimes and regional integration 2. Many scholars of comparative European politics have taken a healthily skeptical attitude to the study of European integration - as either a normative project or as not contributing much to generalisable political science knowledge 3. as long as the empirical impact of European integration on national politics was seemingly small, it could be ignored as a relevant variable - This position is no longer sustainable. With the growing development of the "multi-level" European polity, the disciplinary boundary between comparative politics and international relations is increasingly porous. - The key question asked is what has been the impact of European integration on government and politics in domestic political systems. What is European integration? 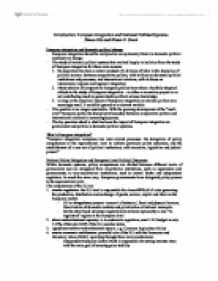 "European integration comprises two inter-related processes: the delegation of policy competences to the supranational level to achieve particular polity outcomes; and the establishment of a new set of political institutions, with executive, legislative and judicial powers" National Policy Delegation and European-Level Political ...read more. EU law are individual citizens rather than the EU statesand that the EU Treaty and secondary legislation are part of the domestic law of the member states - "supremacy" means that if there is a conflict between domestic law and EU law, then EU law is sovereign 4. lobbyism: over 1.000 lobby groups have offices in Brussels with the specific aim of trying to influence the EU policy process. The fact that the Commission is understaffed, requires policy expertise in the highly technical process of harmonizing the diverse European market, and needs the support of certain constituencies for legislation to pass the Council and the EP, ensures relatively open access for private interests at a very early stage of the policy process European Outcomes: New constraints, Reinforcements and Catalysts Political outcomes at the European level have both direct and indirect impacts on domestic political systems: 1. direct impacts are outcomes that require domestic policies to be changed to conform to new European-wide norms 2. More interesting for the present study is the indirect impact of European governance outcomes on domestic political institutions and input processes in domestic political systems: a) European governance outcomes have a significant indirect impact on institutional processes - In the area of administration European integration propels member states to introduce new regulatory policy styles - In the field of judicial politics, the institutional design of the EU legal system, which allows national courts to apply EU law, strengthens the judicial review powers of national courts vis-�-vis domestic executives b) ...read more. Europeanization tends to be discussed in substantive term, while the procedural characteristics, which can only be adequately grasped from a longer term perspective, are often neglected Explaining the European Effect: Varieties of Institutionalism Four main categories for institutionalist explanatory accounts: 1. explanations that operate principally at a macro-institutional level and conceive of both European integration and, in particular, the national effect primarily in institutional terms 2. accounts that adopt a broad understanding of institutions, but again understand the European effect primarily in institutional terms 3. studies that stress individual utility calculations in explaining European effects 4. analyses that likewise emphasize individual behavior, but refer to a "logic of appropriateness" in explaining patterns of national reaction to European integration Conclusion To summarize in order to advance beyond the present state of the analysis of the domestic impacts of European integration, the analytical and theoretical reach of this emergent field of comparative research needs to be broadened in several directions: 1. the present emphasis on policy and institutional aspects needs to be complemented by more sustained efforts at examining the domestic political effects of integration 2. in studying the European impact, substantive effects can only be properly understood if more systematic attention is paid to the modes and processes of domestic Europeanization 3. While it is necessary to disentangle European integration as an explanatory variable and the European effect as a dependent variable, both will need to be "re-entangled" if we wish to do justice to the real-life interdependency of forces of economic, political and cultural change ...read more. However the Court's power is limited. Above all, it must rely on member states to carry out its ruling through enforcement agencies. The perception that it has tended to pursue integrationist goals has led member states to grant it only a very limited role in the justice and foreign policy pillars. Another key purpose of it was to improve Franco-German relations, which were non-existent due to the occupation. The countries that signed up to the ECSC were France, West Germany, Italy and the Benelux countries. These small states have always been instrumental in European integration and had strong federalist sentiments, from a backlash against the resurgence of nationalism. citizenship surely duties, the things the polity asks of its members, are as critical as that which it gives them. The demands of loyalty (not blind, to be sure), of service even, yes, of sacrifice, are as fixed a hallmark of citizenship as are rights.